This is me and Victor. 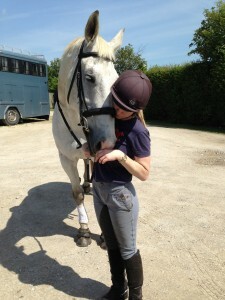 A week after this photograph was taken, pained by an old back injury, he bucked me off headfirst into a field. I landed awkwardly, breaking my neck at C6/7, dislocating 13 vertebrae and bending my spinal cord into an ‘S’ shape. I heard my neck snap and I was instantly paralysed from the chest down. I lay in the field for five and half hours waiting to be found and owe my discovery to Vic. A big 17hh grey he grazed patiently beside me for the whole time and was eventually spotted by another rider who came to investigate and called the emergency services. Stranded as I was in the middle of nowhere, it was impossible to get an ambulance to me and I knew, from the moment I hit the ground, that the only way to get me out would be by helicopter. Before the helicopter can be scrambled, another paramedic has to confirm that it is definitely needed. So my thanks must go to the two ambulance men who managed to find their way down to the remote field on the back of a quad bike driven by another good Samaritan. I don’t know the names of these people but I would like to extend my heartfelt thanks to all of them. The air ambulance was called in fairly short order and it arrived with a spinal doctor already on board. I was quickly stabilised and then flown to the James Cook University Hospital in Middlesbrough. There, I endured overnight traction, an eight hour operation to rebuild and stabilise my neck and then two weeks in a medical coma. I had to have a tracheostomy and a ventilator inserted as I was unable to breathe on my own. After this I spent a month in high dependency coming off the ventilator and learning to breathe for myself again before being transferred to Pinderfields spinal unit in Wakefield where I remained for a further six months of physio and rehabilitation. It was in hospital that my father and I conceived this cunning plan to raise money for both the Yorkshire Air Ambulance and Spinal Research. Obviously I am passionate about keeping funding going to the Air Ambulance as they saved my life. I remain equally determined to raise money for Spinal Research as we are standing on the edge of several breakthroughs in the area of spinal-cord injury and I will endeavour to put as many relevant links about these on the site as possible. Traditionally, this type of injury has always been seen as irreparable and, speaking very personally, I find the negativity of many medical professionals in this area infuriating as well as incredibly disheartening. Both myself and my fellow inpatients were subjected to a line of thinking in hospital that told us that there was no hope and that we should resign ourselves to spending the rest of our lives in a wheelchair. However, if you will excuse the pun, great strides have been made recently including work using a patient’s own stem cells as well as experiments showing that external electric stimulus can re-stimulate the spinal-cord. I firmly believe that discovering a cure for paralysis will be the next great medical breakthrough of the 21st-century. Thank you for helping us achieve this.